This thread summarizes current discussion about all gigabyte aero 15 models (2017, 2018). Info is pulled from the 230 page long thread, plus other forums. I go into detail about max-Q, undervolting, and speaker tuning. (all of which apply to all laptops, not just aero 15). Otherwise this post is pretty concise. Hopefully this also sets the record straight about the keyboard chattering problem. Yes, it is a hardware issue. And no, the firmware doesn't do anything (currently) to help this problem (I prove it below). The only workarounds are software or replacing the keyboard. Click on the spoilers to read. If I missed something you can add it. - 4/30: add random bits, added disassembly video. - 4/29: confirmed keyboard chattering is hardware problem (specifically with the high resistance membrane domes). proof via slowmo video. CPU temps reach ~90C and thermal throttle in stress tests, as reported by various reviews. You should undervolt for sure. Repasting may help, don't expect miracles. The GPU runs 5-10C cooler than CPU and shouldn't thermal throttle (usually power throttles). 100% fan in smart manager = 50-56dBA. In daily light use the machine is actually almost inaudible (with fans set to quiet), just temper your expectations if you were hoping for <70C at load. Chattering, ignored inputs, keys falling off (lol) have all been reported - mostly the former. The true fix is keyboard replacement but software can help with chattering. Likely doesn't affect the majority of units, but be aware this is still happening with the new v8 model. If you have keyboard issues that are really bad, best is to return - firmware updates will not fix a hardware defect. Note that v8 units produced after mid-2018 should have keycaps (R shift, etc) better aligned with the lights. 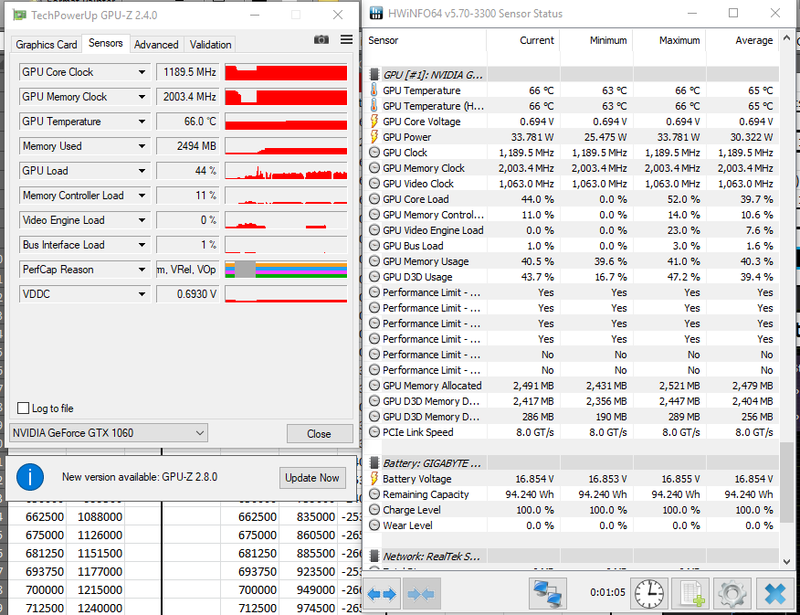 The 8750H models support 2666MHz max via JEDEC spec only and ignore XMP profiles (as of the latest bios 07), and some non-XMP sticks wont boot at all. Search the forum for more info. Reviews for the v8 universally pointed out the LG IPS display and 16GB G.skill ripjaws 2666 stick. Actual retail units get an AUO82ED display , toshiba SSD, and generic 2666 ram with worse timings. Also, the slim chargers with the integrated USB charging port have been discontinued. The RAM situation is sad. 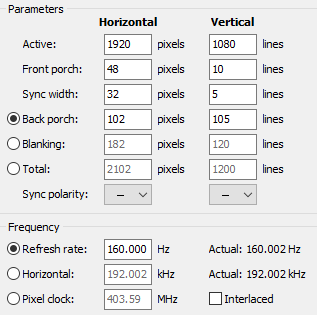 The AUO also overclocks to 160Hz (see below). It is unknown how far the LG overclocks. Smart manager can break permanently on new windows installs. Fusion RGB software is worst in the industry; freezes a lot and cumbersome to customize every key. Fortunately it seems rare. Will not be mentioning this issue anywhere else. 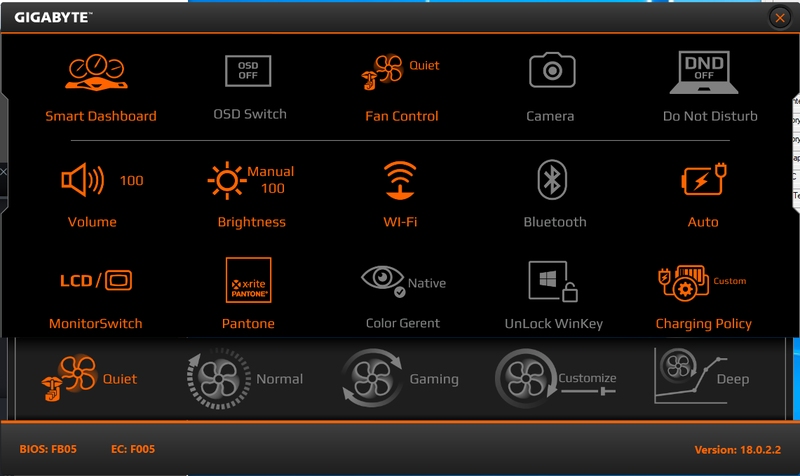 This video goes over changes in the v8 model, shows off smart manager's fan settings. The smart manager skin has since been updated for v8, v7 still uses the old UI. - all models use identical chassis. - heatsink on aero 15 is identical to heatsink from aero 14. - the slight reduction in thickness in the v8 models comes from the slightly thinner display. - BCLK overclock (+1-3% ish) is only available on v7 models, more info below. - All v8 models have intel speed shift enabled by default. There is no option to disable this within the BIOS. - Early aero 15v7 models had a keyboard that ignored some key combinations. This was a hardware limitation revised during production. New aero15 w/x v7 models - and all v8 - don't have the key combination issue. - All aero 15 w/x v7/v8 are susceptible to keyboard chattering (duplicate key presses), this is a hardware issue related to the rubber domes. more info below. Aero 15 v8 models will not (as of 11/2018) run RAM modules at their rated speed if that speed is saved to an XMP profile. The rated speed must be presented on the JEDEC portion of the SPD. The max supported speed is 2666MHz (eg, 3200 g skill ripjaws modules will run at 2400). RAM that uses XMP to achieve 2666 or higher speeds will run at a lower speed or may not boot. Sometimes, seemingly compatible (non-XMP) RAM modules will not boot anyways. All aero 15 models use the same elan touchpad. On all aero 15 models, you can replace the elan drivers with precision drivers. 3. Double click the device to open properties -> driver tab -> update driver -> Browse... -> Let me pick -> Have Disk -> navigate to the ETD.inf file. 5. Open device manager and find the Elan MTP device. Recommended: Disable ELAN service from services.msc. This service and its processes constantly eat CPU cycles and cause interrupts but are not needed for the precision touchpad to function. Precision mode should be unlocked now. Some users do not have to do steps 5-7, but others will have to. This depends on which version of the elan drivers are already installed. Some users may have to open control panel -> mouse -> elan tab -> enable device -> apply/OK to activate precision mode. Not sure why, this is rare and is only needed if you really messed with the driver before hand. Precision gestures can be configured via the 'new' control panel. It's in there. - System agent is for uncore, which includes the display controller. - XTU allows you to adjust CPU BCLK (base clock). BCLK adjustment is not available on 15x-v8 models. This affects every frequency in the system (including CPU, RAM, PCIe, etc). However, bclk is hard-limited to around +3% due to the lack of an external clock generator. [source 1] [source 2]. If you're not going to touch this, throttlestop may be better. BCLK adjustment requires intel ME installed. - XTU resets your settings if the computer crashes/BSODs, regardless of whether it was due to an undervolt. For this reason throttlestop may be better. - System agent contains display controller, undervolt it too far and your screen will glitch out. Use MSI afterburner (google it). Press Ctrl + F to open the core voltage/frequency adjustment curve. Press ALT to adjust all points. Use the UP/DOWN ARROW KEYS to move a point in 1MHz increments. The voltage/frequency curve selection is just a big lookup table with some throttling conditions. It is pretty easy to understand. 1. The stock gpu core frequency / voltage curve (look-up table) is shifted up or down based on GPU temperature. - Each point is shifted up or down by 13MHz at temperature thresholds of ~44C, ~50-55C, ~60C, 72C, 77C, 82C, 88C. - At every critical temperature, only some points along the curve shift. This is because the GPU actually wants to move the curve with more granularity than 13 MHz, but it can only clock in 13MHz increments. This means (for example) that at 55C, some points in the curve drop 13MHz while the ones that didn't will do so at 60C. - This means that performance scales with temperature: lower temperatures = higher core clocks. 2. The GPU will now set itself to the highest voltage point allowed for the system, usually 1062mV. 3. If any points to the left have same frequency for less voltage, we will go to that point. - Unless there is a reason to throttle the GPU, this is the final voltage/frequency. - Reliability limit: depending on the workload, GPU boost often thinks that the current core voltage cannot sustain the clock speed, and it will shift to the next point on the left. This is responsible for most of the clock speed fluctuation on nvidia GPUs. Increasing temperatures also drop the frequency on higher voltage bins, essentially limiting the max voltage. This type of throttling is also considered Vrel. - Power limit: we cannot exceed the hard limit of 70W (+/- 5W) which is hard coded into the vBIOS (aero15 with GTX 1060) [the limit is 85-90W on aero15x with GTX 1070 mQ]. - Thermal limit: we cannot exceed 92C. First, determine the max voltage you want the GPU to run at. - Find the point at that voltage in afterburner, and move it up or down to the frequency you want. (you can only move points up or down, not side to side). - Set all points to the right of it to be the same frequency. As explained above, the GPU normally tries to run at 1062mV. If it notices that points to the left have the same frequency for lower voltage, it will go there. 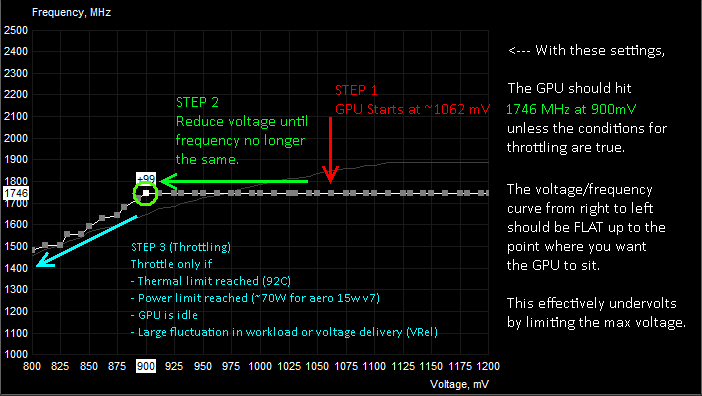 Therefore, doing the steps above limits the max available voltage to the GPU (undervolting). Note that while you are setting up the voltage/frequency curve in afterburner, when you click 'apply' - some of the points on the graph will shift. This is because GPU boost alters points along the frequency curve depending on the GPU temperature. Read the section above (How GPU Boost normally works) to understand why. If the shifting points messes up your straight line, you will need to go and fix that - make sure the line is completely flat. - the GPU will not exceed 900mV, ever. - the GPU will not go below 1746 MHz at 900mV, unless there is a reason to throttle. You can choose different settings but the curve should look similar: ramping up to your selected freq/voltage and then flat at all points past it. If you want to undervolt to 800mV, you can. The curve will just be complete flat in that case. Unigine heaven - good free benchmark that should allow you to test the undervolt. Note that real games will be more sensitive to stability. Furmark - not recommended because you are likely to hit the GPU power limit immediately (and thus clocks will be all over the place which doesn't make for great testing). Read above section. MSI Afterburner allows you to cap voltage to 800mV. If this is not enough for you, it is possible to go down to 625mV (450mV in theory but the GPU will refuse to go under 625 at load) using other tools. gtx 1060 model locked to 0.7V @ 1190MHz, drawing 33W (power limit is around 70W). same conditions (aero 15w v7, gtx 1060) but locked at 0.625V @ 835MHz, drawing 25W. Edit: on further testing, the 1060 in this unit was able to do ~1150 core at 625mV. The aero15 v8 (gtx 1070 maxQ) I tested manages ~1303 core at 625mV. More info/tutorial if people are interested. GTX 1070 max-Q vs GTX 1060, worth $300? To answer this question we need to fill in some background information about what 'max-Q' actually means. Most online sites refer to max-q as some magic black box created by nvidia that reduces temperatures, lowers power consumption, and caps fan noise to 40 dB-A. Only one of those things is true. Max-Q is not GPU binning (confirmed by nvidia, google it), it is not specially tuned VRMs or drivers, it doesn't specify fan curves, and it is not anything more than fancy marketing. As the chart above shows you: max-Q is just a vBIOS power limit. On the aero 15, GTX 1060's power limit is 70W (does not match the table). GTX 1070 max-Q power limit is 90W. Nvidia is just hoping that the lower power limit reduces acoustics. This is true, but only between max-Q and non-maxQ version of the same GPU, and not between a max-Q GPU and a non-maxQ GPU with similar power limits. Nearly all modern games will push the mobile GTX 1000 series to their power limits, so the GTX 1060 (15w) and the GTX 1070 max-Q (15x) will both throttle in many tasks. Their true performance difference is only what the extra 20W in headroom allows. Therefore when pushed to 100%, the aero 15-x will be hotter and louder than the non-x, despite its max-Q branding. Doesn't this mean the mobile 1070-maxQ should stomp the mobile 1060? The 1070 max-Q has a bigger memory bus (33% wider), which draws power. And sure, the wider 1070 can be run at slower clocks and less voltage, but power consumption scales with voltage, frequency and also core count - so the efficiency advantage is not going to be mindblowing. Also consider that all models of the aero 15 are already nearing 90C at max load. The 20W higher limit on the 1070mQ may not translate fully into higher performance if you are already running against temperature limits. In synthetic benchmarks, the 1070 max Q has a 25% lead at most. In real games, the difference can be as low as just 5%. Is the 300$ upgrade from aero 15non-x to 15-x worth it? Because both GPUs will run into power limits most of the time, you will be trading 300$ for a slightly louder and hotter system that is anywhere from 5% to 20% faster in terms of real-world GPU performance. Compared to desktop hardware, the 1070 max-Q roughly matches a desktop 1060 6GB, R9 390X, or GTX 980 (though using much less power). The 1070mQ makes more sense if you plan to undervolt. This is a good way to avoid the power limit and reduce thermals/noise. Because the 1070 is a wider GPU, undervolting/clocking it will reduce performance less than if you were to do the same to the GTX 1060. Undervolting is the scenario where the 1070 max-Q extends its efficiency advantage vs the 1060. Read the section above on GPU undervolting to understand how to do this. Make sure smart manager is not set to quiet. In quiet fan mode across all models (15w/x - v7/v8) the CPU package power is capped to ~16W and the GPU memory clocks are limited to 400MHz (down from ~2000MHz). The CPU power throttle will appear as EDP/EC limit in throttlestop. You can get around this type of throttling while still having the fans run at minimum by going into smart manager fan settings -> manual/custom --> change the bottom (fixed) slider to 30/35%. Fortunately if you are not in quiet mode, gigabyte does not lock CPU power limits. Both PL1 and PL2 power limits can be adjusted, so you can make the TDP arbitrary. GPU thermal throttling will occur regardless of fan setting at 90-92C. Unfortunately, shorting the 5mOhm shunt resistor on the bottom of the board (on the side with the power connector, and may be under a piece of tape) does not lift the GPU power limit like on desktop cards. I tried with liquid metal and could not get any additional clock speed at 625mV fixed voltage on a workload that was power throttling. Nothing really to say except the heatsinks are really dinky. Surprising they even work given the specs. At 100% fan speed, volume is appx 52-55dB as reported by various reviews. VRM Mosfets are cooled by the heatsink through the thermal pads. The GPU inductors get hot (top left cutout in this image) but it's fine. Air intakes are through vents on the bottom, and also through the keyboard - though that flow is very restricted. The large middle vent on the bottom of the notebook does not normally draw air unless you block the bottom side vents (eg the laptop is resting on your legs) - however it is useful if you want to use a large cooling pad (clever design). 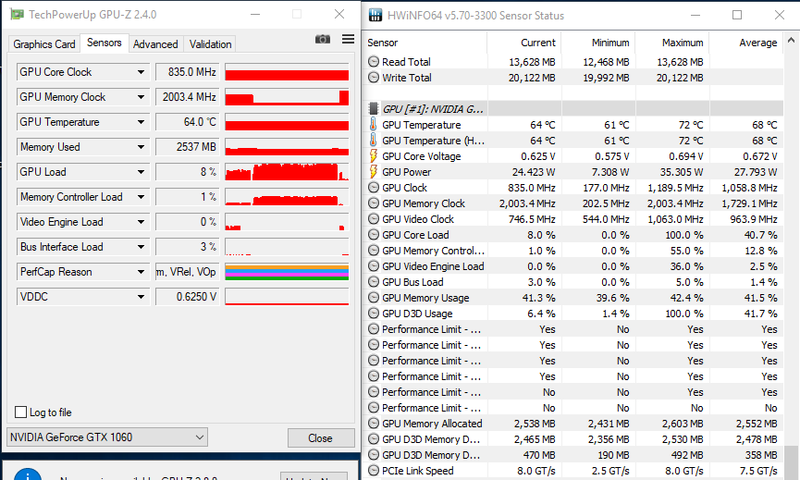 Generally at full load on CPU + GPU (maxing power limit) and stock thermal paste, reviews peg CPU temperatures at 80-90C (possibly throttling at ~90C) - GPU temperatures 70-85C. This is fairly consistent for all variations of the hardware. The CPU draws 45W (long-term limit), but boost power limit & duration can be raised via XTU or throttlestop. (example: the 8750H can draw 66W forever in prime95 if you set PL1 & PL2 to 66), thermal limits (not power limits) are the real issue for the CPU. The GPU draws up to 70W max (1060) or 90W max (1070mQ). The GPU always runs cooler than CPU and is less likely to thermal throttle, but there is no way around the power limits. Temperatures above are for the aero 15x v8 model (8750H + 1070) but should be true for others since power limits are similar. Obviously some variation depending on workload & ambient temperature. Note that aero 14 and aero 15 share the same heatsink. If liquid metal is used and heatsinks are polished, results can be better. Please use caution with liquid metal: Some users in the large thread reported no gain or worse temperatures after applying LM. The universal recommendation is to use conventional thermal paste, or leave the system stock. 13 Screws on bottom panel in total. Torx T6 bit for all of them. 3 Screws in the middle are longer and each have anti tampering sticker. Not hard to open but you will have to pry the bottom panel off - requires some force since clips surround the entire panel. The clips are rather strong, there is little chance for them to snap unlike on other devices. Destroying the anti-tamper stickers on the screws does NOT void the warranty. Make sure you back up the pantone color profile. Downloads for the color profiles are attached in the bottom of this post. These files are provided for compatibility reasons only (in case you lost yours). Because colors vary between panels, you should not expect these profiles to be 100% accurate for your display (especially if they are individually calibrated, which is not confirmed). Thanks to headkaze for providing the AUO31EB (4K) icc. Some users report that smart manager does not work on new windows installs. If this happens, try doing another reinstall of windows. Download smart update and install all drivers first. Then install smart manager. Should work now. More detailed info below. Smart manager is required for the fan tuning & brightness control via keyboard to work. The tool may not work for all users - so consider any reinstall of windows to be permanent. If smart manager does not like your windows install for whatever reason, it is very difficult (perhaps impossible) to get it working. You can try reinstalling drivers/uninstalling or updating smart manager/doing all sorts of weird stuff and it will still likely not open. However, Smart manager will work if you do a fresh windows install and carefully follow the directions below. Confirmed that this procedure works on aero 15 v7 and v8. Other users have confirmed that reinstalling windows and installing drivers/apps in the right order fixes smart manager. If you can't find these versions of SM, just download the latest. NOTE: Make sure you do not install smart manager first on a new install of windows. SM seems to depend on files/utilities/drivers already being present and in the correct places. NOTE: When the gigabyte utility installers (smart update, fusion, smart manager) ask you to reboot, make sure you wait a couple of seconds and click reboot instead of cancelling. This software is very fragile - Do not try opening any other software if you haven't rebooted. Happens to many laptops running Windows 10 + nvidia gpu in optimus. Various reports across the net (google it). Problem is applications are somehow momentarily waking up the nvidia gpu, causing freezes across the OS whenever you try to do something. Nobody is sure exactly who is responsible, best guesses is microsoft (changes in windows 10 related to hybrid GPU setup) according to ms forums (intel rep posted there, go google and find it if you are really interested). Complain. Wait for driver/OS updates. The ChiMei CMN15D7 found on v7 models (60Hz) is a garbage overclocker. Expect 63Hz max using LCD standard timings. Here are notebookcheck reviews of the AUO82ED  and LGD05C0 . Response time: The AUO82ED achieves 9-7ms (better), the LGD05C0 achieves 12-19ms. Brightness: The AUO82ED achieves 270-350 nits, the LGD05C0 achieves 290-310 nits. Another source claims the LG panel can hit 300-350 nits. 63Hz: Use CRU's LCD-standard timings. 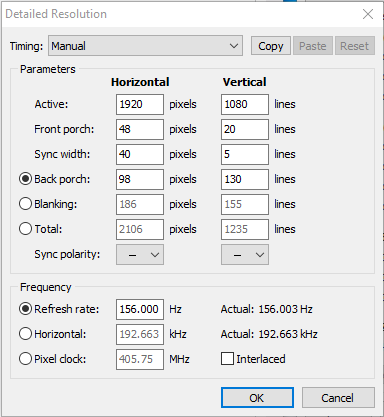 Anything past 63Hz will artifact. There is literally almost nothing in the gigabyte BIOS, no option to set voltages/clocks/fans etc. The most you can do is disable the GPU/turn off secure boot (called 'reset secure boot variables'), and set boot device. On aero v8 models (8750H), speedshift is automatically enabled. There is no toggle to disable it in bios. In both v7 and v8 models, the intel integrated GPU drives the laptop display and the thunderbolt port. No, you cannot charge via the thunderbolt port. The nvidia GPU drives all external displays. When you hook up an external display (excluding via the thunderbolt port), the nvidia GPU will become active. External displays should support G-sync. On v7 models the logo is driven by the display backlight. 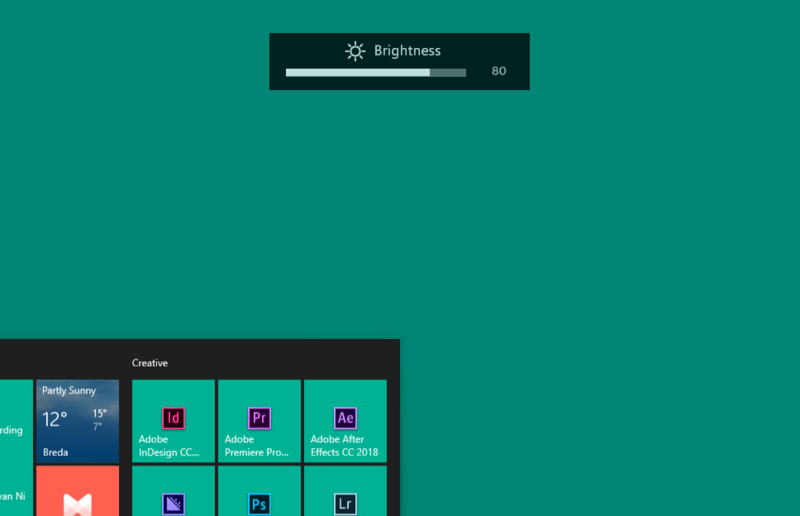 Proven by watching logo brightness change with display brightness. On v8 the logo is lit independently. There is no way to turn it off. Aero 15 v7 was released in 2017 with intel 7700HQ ("14nm+") & GTX 1060/1070. Aero 15 v8 was released in April 2018 with intel 8750H ("14nm ++") & GTX 1060/1070. This late-2018 refresh will not have next gen intel CPUs because 10nm was delayed until 2019. Instead you can expect the same CPUs, or maybe a 14nm+++ refresh of a refresh of a refresh of skylake. Updated 4/29: Thorough testing of the keyboard (incl. disassembly, slow mo capture) revealed that the issue is hardware related, specifically caused by membrane dome. The keycaps and plastic retention bars underneath the key are not to blame. This is a common (but not universal) hardware issue with the higher pressure membrane domes used in the keyboard. Gigabyte uses the same keyboard across the entire aero 15 v7 & v8 lineup. Not every unit is affected, and some may be affected but with rarely-used keys (to the point where it is irrelevant or unnoticeable to the user). The impact of this issue varies significantly. Affected keys may only double-type occasionally, all the way up to once per hundred/ten keystrokes. Will firmware fix the issue? Because the key chattering is a mechanical issue caused by re-actuation of the electrical contact, the actual 'chattering' (repeated key) can occur anywhere from 0ms to 180ms after your initial keystroke. Therefore, any software fix would have to set a threshold of time to reject repeated keys. In theory, a threshold that is low will allow chattering to happen. In theory, a threshold that is high will catch most instances of chattering, but could interfere with typing. As of 4/27/18, keyboard firmware 3.0.8 is not rejecting chattering keys. Proof: the image below was captured using third-party software. The 'M' key was pressed in quick succession to simulate chattering. The simulated chattering (25ms after the first keypress) was detected in Windows - meaning that the gigabyte keyboard firmware is not filtering out chattering keys. So what are the firmware updates doing? Nobody knows. Maybe just updating the RGB backlighting functions. How come some people claim that the firmware fixes their key chattering? - They didn't test enough. (typing 400 words when only 1 key has the problem is not very thorough). - They forgot to turn off their software workarounds. Keyboard chattering app (google it, download from softpedia) - a threshold of ~95ms should not interfere with typing for most people. My chattering is especially bad - what should I do? Buy from a retailer with a generous return policy. Return the laptop/get a replacement. Alternatively, contact gigabyte for an RMA (you will have to register serial number etc). May have to pay for shipping. Turnaround times may be slow depending on region. The only true fix is hardware replacement. Yes, this is a real problem that occurs for some users - and may occur alongside keyboard chattering. Both the v7s I tried had chattering (one not too bad, the other horrible) but not this issue. The v8-x I tried has both chattering (not too bad) and this issue (not too bad), date code on the chassis is Jan 2018. Speculation: Gigabyte/their keyboard supplier probably changed the dome to reduce chattering and now they ended up with keyboards that still chatter and also ignore your inputs. Solving the problems of today by creating new ones for tomorrow. The right shift key on all aero 15 keyboards features centered 'shift' text, but the LEDs are on the sides of the key. Disable callGigabytefusionshortcutService from startup in task manager. This does not affect gigabyte fusion or the keyboard backlight functionality. The speakers can be tuned in software. The section below shows you how to boost the bass - mainly by reducing the volume of all the other frequencies. This will sacrifice max volume for more balanced sound, but you can change the strength of the effect if it's too much for you. 1. Download and install Equalizer APO. 2. Uninstall the realtek audio drivers - they are not compatible with equalizer APO (as in, the settings in eAPO will get ignored with the realtek driver installed). 3. Open the equalizer APO 'configurator' and 'install' it for the 'speakers' device. 5. Now open equalizer APO's 'configuration editor' and play around with the equalizer - leave the audible bass frequencies alone (or boost by 1-5dB, try to avoid clipping) and attenuate everything else. But I have no idea how to use Equalizer APO? To make your life easier, I uploaded my bass-boost profile to this post. Download config.zip, extract 'config.txt', and paste it into C:\Program Files\EqualizerAPO\config. The change should take effect immediately. To turn it off, open the configuration editor of equalizer APO and hit the power button looking things to the left. What about the optional software? Only install breakaway audio enhancer and volume2 last. BAE is a system-wide tool for leveling volume (eg making obnoxiously loud sounds quieter and turning up faint sounds, which is good for music/movies/youtube) and adjusting bass. If you decide to use BAE you need to set the output to "DS" mode (safe mode) or else it will bypass equalizer APO. Volume2 is for controlling specific audio devices via hotkeys/mousewheel over the taskbar. You only need volume2 if you install BAE since breakaway will get set as the default audio device but volume control needs to be done with the 'speakers' audio device. Both pieces of software are totally optional, if they sound confusing to you - don't install them. What about the dolby digital app? Obviously in this case, you would not install equalizer APO, but you would install the realtek drivers (which should include the dolby digital app). Make sure to turn volume leveling off in the dolby app since it sabotages the equalizer. Equalizer APO is more configurable and more precise, but dolby digital app may be easier to use for most people. Again, Aero 15 v8 users cannot use the dolby digital app method - they must use equalizer APO. I still don't know what's going on at this point!! You may want to read a tutorial on how to use equalizer APO (youtube has some great ones) and read the instructions more carefully. The previous version of this section went into great detail on how to set everything up with spectrum graphs to prove how well the tweaks worked, talked about how to use breakaway audio enhancer and volume 2, went into the atmos app, etc. It just ended up confusing people. All you need is equalizer APO and the config file attached to this post. Go nuts. Issue A can be checked via nvidia control panel -> turn on gpu usage tray icon. Older (2017) version of smartmanager ran emptyproject11.exe all the time to keep the GPU on to avoid freezes in windows 10 (optimus issue). New versions of SM (2018) don't do this but you may notice mouse freezes. Wake GPU (optional app provided by gigabyte) does the same thing - keeps GPU on to avoid freezes but eats battery life. Issue B is very insidious, likely related to gigabyte software. If you switch fan modes/power plan options using gigabyte smart manager with throttlestop open, you will notice package power use jump up to 12W sustained for several seconds. It should come back down to idle but may not always do so for some users. This can destroy battery life (normally the CPU only uses <3W idle). Issue B can also arise when the nvidia GPU is toggled on or off - for a period of time afterwards you will notice the package power reading 12W. This should drop back down to normal levels after a while. This is a windows 10 issue. Like the optimus mouse-freezing problem, it is caused by hybridgpu/mshybrid that was introduced in windows 10. Fortunately this one is fixable by restarting dwm.exe (desktop window manager). Probably you will want to create a batch file for it. JC1987, EvilTak, salomamo and 17 others like this. Very informative, thanks for posting this! I can confirm that the V8 Gigabyte logo is lit independently of the screen. Adjusting the brightness of the screen has no effect, neither does shutting the screen off altogether. maybe can you help me how to undervolt this card? Very interested in this model, weighing it v. Msi gs65, but don't like the chances of the keyboard issue. Any idea when/if a new version will come out? Please show the alternative method to undervolting the GPU beyond 800mV. I am very interested. i never backed up the pantone icc profile. Anyone have one that I can use for the new 8th gen aero 15x? it's a bunch of tools: nvidia inspector for resetting oc (not nvidia profile inspector), nvoclock (interfaces with overclocking api), excel (for editing the v/f curve as a csv). Need to use command line except the part about editing the curve with excel. All you need is what I mentioned above, just google. There is an issue with this method: gpu clocks actually go up when temperature increases (inverse of normal gpu boost 3 behavior....) but that seems to be mitigated mostly if you base delta curves off the stock curve at high temperatures (~80C), and also drop your own curve down a boost bin for safety. Applied curve is also based on deltas and not abs clock which you don't see documented anywhere. Nv inspector is also german origin and need to search around for latest version. There may be some other small idiosyncrasies I am forgetting right now but those are the big ones. If you DL those tools (just google) you can figure it out - just a little cumbersome. I have the process worked out and it does work but just not super easy to explain. I might come back to this and add more about it later.